The Daihatsu Mira Walk-Through Van is one of those things that could only come from Japan, a place where a coffin is considered to be a flat. Now, I love the Volkswagen Fridolin. I really do. But what if you're looking for something smaller, right? 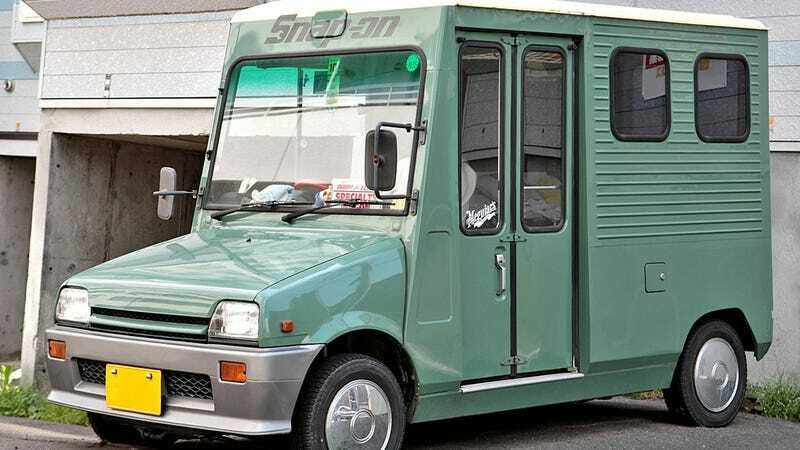 You start wondering about kei cars. Because Kei cars are the best at being tiny but still practical. And I have a soft spot for Daihatsus. On walk-through van bodies were available right from the start with the first generation Mira appearing in 1980, positioned under the high-selling Charade compact. While the Mira was available with a turbocharged three-cylinder engine and all-wheel drive, and although I'm not sure which body style came with which powertrain, you could surely jam any part from one to another, ending up with a four-wheel drive turbo walk-through van that's only 78 inches tall and have a four-speed manual. Imagine that!